Madonna offered to support the African baby she hopes to adopt and leave him in Malawi but his father declined, the pop star has told the BBC. In a Newsnight interview, shown on Wednesday night, she denied reports that David Banda had regular visits from his family at his orphanage. She "became interested in him" after being told he had been "left in the orphanage", she said. He is now at her London home after she was granted a temporary custody order. Madonna denied newspaper reports that David had regular visits at the orphanage from his father and his grandmother. "I never met a granny and I was told... that from the day that he was left in the orphanage he was not visited by any extended family members and that's really why I became interested in him. "If someone had said to me, 'His dad comes every week or his granny visits on a regular basis and he's well looked after,' I would not even have given it another thought." There were "many conditions" that made her "worry for his life", Madonna added. "One was the fact that, according to the reverend who ran the orphanage that David came from, his father never visited him. Oprah Winfrey and now Newsnight... But are we right to do the interview? "His father lived 50 or 60km away, had no car, had no money and, as far as I was told, had remarried and moved on with his life." 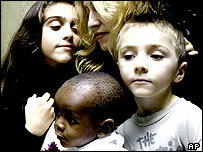 Madonna was also interviewed for NBC's Today programme, in which she gave a glimpse into how David would be raised. She confirmed the child was already wearing a red string bracelet, worn by devotees of Kabbalah, a branch of ancient Jewish mysticism which Madonna follows. "If David decides he wants to be a Christian, then so be it," Madonna said. "I believe in Jesus and I study Kabbalah, so I don't see why he can't too." She said David was "hysterically funny" but also had a "terrible temper". On Friday, the hearing of a case brought by Malawi rights groups challenging the adoption was adjourned until 13 November. An alliance of 67 groups is pushing for the right to challenge the interim adoption order which let Madonna take one-year-old David out of the country. His father was at the court, protesting against moves to halt the adoption. Mr Banda told the BBC he feared the controversy stirred by the groups could prompt Madonna to return his son. He urged the human rights groups challenging the adoption to leave the child alone and added that he was unable to look after David himself. Madonna funds six orphanages through her Raising Malawi charity and is setting up an orphanage for 4,000 children in a village outside the capital, Lilongwe.